These words rise from heart to head each morning as I wake. I hear them walking away from a networking meeting at the small, brick café down the street. I hear them when the kids whirl around the kitchen like snowflakes in a blizzard and it’s all I can do to keep from blasting them into submission with a giant stomping shout. “Slow down,” the voice says. In seminary we ran intellectual marathons – punishing races in pursuit of excellence. In the hours when the kids are at school and I am my own boss, I feel myself pushing again in that old, familiar pattern. Run hard, run fast. Do more. Do it better. Move, move, move. Last week we had the twins’ four-year-old well-visit at the pediatrician’s office. John and I met at the office and the boys stripped down to their underwear and clambered around the room while we waited for the Dr.
We asked about their speech, which the preschool seems to think needs fixing. We got caught up on necessary shots. With their birthdays falling in August, the appointment was well overdue. Between the well-visits, the eye dr. and the dentist we, it seems, are falling behind. “I can’t keep up,” I say to my husband, to myself, to anyone who is still long enough to listen. The thought of the dentist appointments needing to be scheduled and adding speech therapy for two into the mix? It causes a panic in me, like water rising around someone who cannot swim. Last year, coming off of a weekend of panic attacks, I took the twins to their well-visit by myself. In the exam room panic rose around me. My heart pounded, skin flashed hot and cold. Two half-naked boys perched, one on each knee, was all that kept me from rising, running from the room. Maybe this is why the voice tells me, “Slow down.” Because we can only spin so fast before we lose our balance and start to fall. Sometimes slow is the only way to be. Sometimes slow is the one necessary thing. 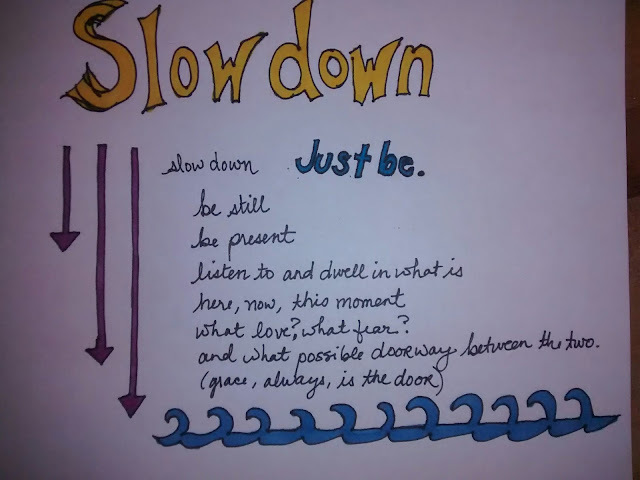 Sitting with those words, "Slow down," and my markers, I found a few more words - maybe you need them too in this too often frenetic holiday season. And what possible doorway between the two? Keep slowing, keep singing the song, yes and amen. We need it.